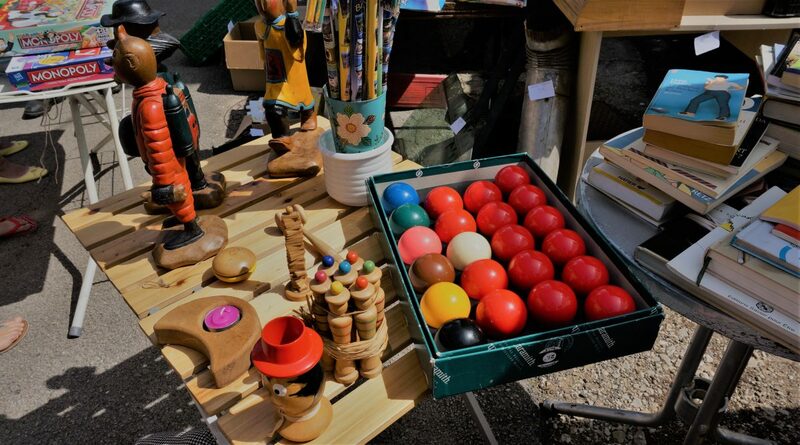 It’s the heat of summer, and in France, that means it’s Vide Grenier season. Vide Grenier translates to “empty attic”, and it’s a kind of neighborhood yard sale that is held in every village, once summer rolls around. Since they almost always take place on Sunday, a day when almost all other businesses in France close, the good ones are well-attended. People travel from neighboring villages and regions to sift through tables of household items, looking for that odd vintage clock, funky wall decoration, or set of vintage beer glasses. It’s a fun way to spend a lazy Sunday afternoon, even if you go home empty-handed.